Richard Anuszkiewicz was a young man, just turned thirty, when he first came to prominence in 1960. By the end of the decade, he was the leading Op painter in America, enjoying an international reputation1. Today the wunderkind of the sixties is a vigorous septuagenarian and one of Americas prized old masters. 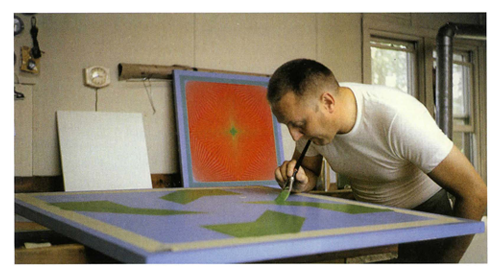 Anuszkiewicz perfected a way of exploring color effects that his contemporaries and successors were obliged to respond to, either in emulation or in reaction against. Early success gave him the freedom to pursue his ideas. Although classified as an Op artist, a term he did not invent, he never belonged to a group, although he is proud to have studied color with Josef Albers. This complete catalogue of his paintings and sculptures covers the whole career, spanning more than four decades from the formative years to the most recent work. Hundreds of pages of previously unpublished photographs and information bring into relief the importance of Anuszkiewicz's contribution to modern art in the second half of the twentieth century. The purpose of this brief essay is to outline the major periods of his development, drawing upon this new material.